Thank you so much for all the kind birthday wishes, I had a wonderful and fantastic week. The celebrations began early last weekend over brunch with some of my closest friends in the city. Later towards the end of the week, we celebrated for one last time with my friend Tyler's family at a delicious French restaurant in Bethesda called Mon Ami Gabi. The food was great and the company spectacular. What more could one ask for on a special day (week) than to spend some time with people that I care about dearly! Each year around birthday time, I get myself a special gift, something that I really want but I could do without. This year was no different and I picked myself an ice cream maker that I have had my eye on for a very long time. It was one of those things that I know I certainly didn't have place to store but felt that it might be useful appliance to own. My opinion changed quickly after my first experiment with it, to hell with kitchen space economizing theory, I did indeed need an ice cream maker, its divine delicious abilities made up for any space that was lost! A personal ice cream churner in the kitchen is amazing, it takes away the crazy moments when you keep opening your freezer at different intervals to churn the ice cream and break the ice crystals. It was definitely a worth investment. 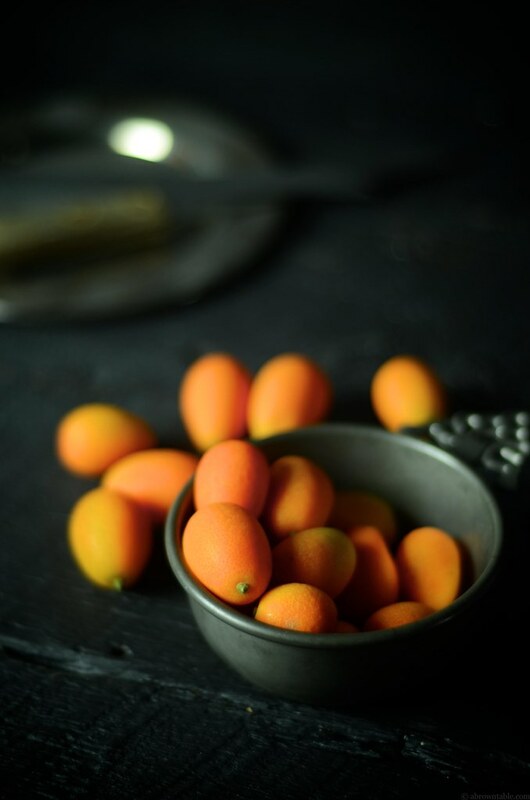 When it comes to kumquats, I'm not a big fan of eating them raw, the skin is pleasantly sweet but the flesh is tart and sour which makes my face cringe and pucker, every time I take a bite into these little guys. However, I do enjoy kumquats when they are cooked as preserves or spreads and in desserts, such as this sorbet. The first frozen dessert that I made many, many years ago was a lime sorbet. I didn't have an ice cream maker then and I almost crashed my mom's freezer by opening it every fifteen minutes to break the ice crystals that were forming. Based on this personal history, it only seemed fitting to have a sorbet as the first recipe from my new ice cream maker. To get rid of some of the harshness of the fruit, I trimmed the tops and bottoms of each kumquat and brought them to boil in water a few times. This also helps to make the skin of the fruit much more tender and easy to puree. I also added in a little bit of crystallized ginger to give the sorbet a little texture and bite. By boiling the ginger in the simple syrup, the ginger flavor mellows down just enough and also imparts a light flavor to the syrup. Once the ginger was infused into the syrup, I let the kumquat puree rest with the syrup, before passing it through a fine meshed sieve. 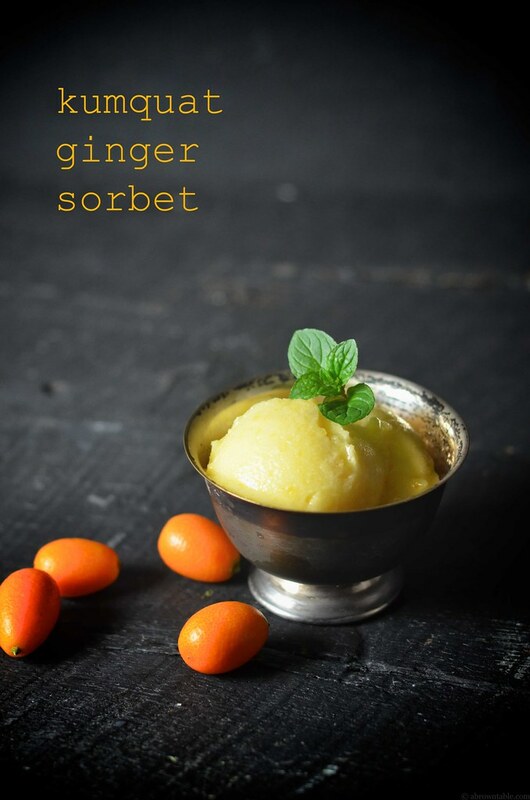 Once the ice cream maker did its thing, the resultant sorbet was delicious, it was creamy, soft, tender and citrusy with little bits of ginger and little strands of orange kumquat zest. Instead of using plain mint leaves to garnish this sorbet, I used some fresh chocolate-mint leaves that I planted a few weeks ago. This mint variety goes amazingly well with the citrus flavors of the sorbet. The leaves have a light chocolate flavor when you first taste it before the mint kicks in. 1. Rinse the kumquats under running cold water. Cut each fruit in half and trim and discard the tops and bottoms along with the seeds. 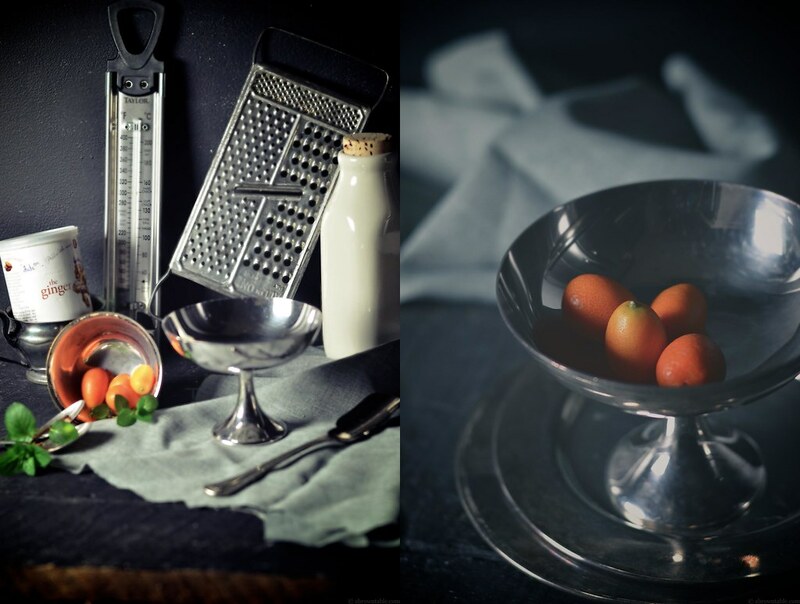 Place the trimmed fruit in a medium sized saucepan. Add two cups of water to cover the kumquats completely and bring to a boil on a medium flame. Once the water boils, discard the water and repeat the boiling process twice with the rest of the water. 2. 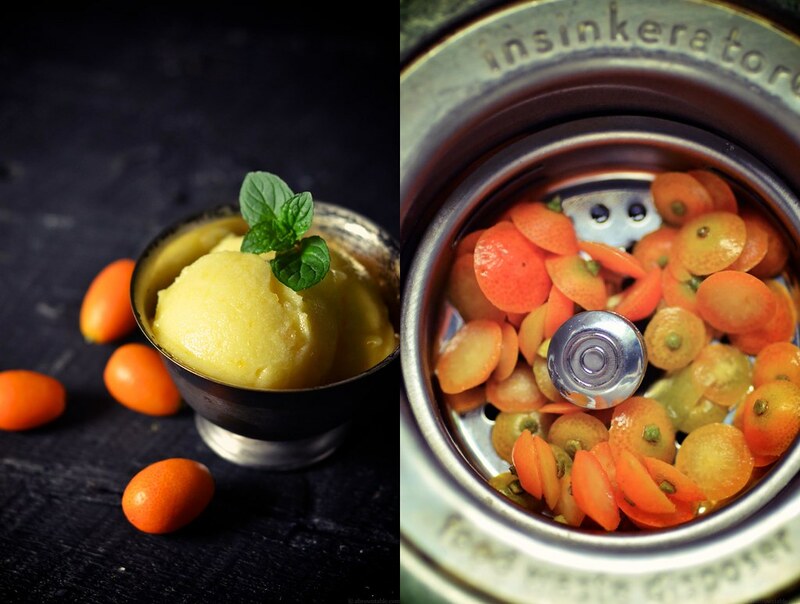 Process the kumquats in a food processor to a smooth puree. 3. With regular stirring bring the 2 cups of water and sugar to a boil along with the ginger. Remove the syrup from the flame and pass the syrup through a sieve to collect the ginger bits. Keep the ginger aside. 4. Put the syrup in a glass mixing bowl and keep over an ice water bath. Stir in the kumquat puree and allow to cool to room temperature. This will take about 30-40 minutes. Pass the syrup through a sieve and with a large spoon press the fruit pulp against the sieve to extract as much of the fruit as possible. 5. Chill the syrup in the freezer for another 45 minutes before adding it into the ice cream maker. Follow the instructions that came with your ice cream maker, they vary a little by brand. Carefully drop the ginger bits, a few at a time during the last five minutes of churning. The sorbet is done when it is frozen and gets a light milky orange-yellow color. Transfer to a clean freezer-proof storage container and freeze for at least another 1 to 2 hours before serving. Serve a scoop or two of the sorbet with fresh chocolate-mint leaves. 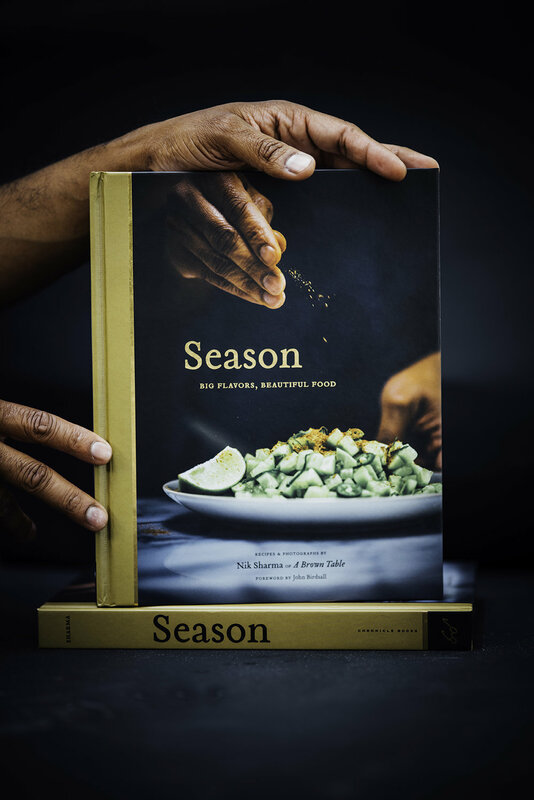 In "Citrus", "Dessert", "Frozen Ice", "Fruit", "Sorbet", "frozen", "kumquats"